Consider this oddity an introductory piece – in that context it works just fine. The cast of dancers and acrobats offers a highly condensed version of the Love show backed by a medley of Beatles’ recordings. Though the tunes are McCartney-centric, this sets a tone for Beatles-era dominance (as opposed to solo McCartney) that will carry throughout the show. Though McCartney himself opened with a well-worn Beatles classic (a somewhat oddball choice at least), he thankfully switched gears quickly turning to the rocking 1974 Wings hit “Junior’s Farm.” Backed by his touring (and sometimes recording) band of the past decade (at the time, more like 13 years now), the guest of honor is in fine form. Alone at the piano, Keys delivers a stirring, personal interpretation of this “White Album” gem. She neatly transfers the more familiar acoustic guitar-picked rhythms to the keyboard. It’s an early highlight of the show. Here’s the key performance of the night. Krauss and her band do a unique country arrangement of this woefully neglected 1984 hit single. Despite including it on hits compilations like All the Best! and Wingspan, McCartney has so far refrained from playing the song live. Krauss gives it a tender, lilting reading, making it her own while paying tribute to one of McCartney’s best solo ballads. Veteran guitarist Eddy is backed by McCartney’s band for a fairly standard-issue instrumental reading. There’s nothing that’s of much interest here, though Eddy’s guitar playing is certainly tasteful. It feels a bit like filler, to be honest. This version, which finds Jones singing at the piano, is reminiscent of The Beatles’ own original arrangement (as heard on an outtake on Anthology 3). Jones delivers a smoothly melodic vocal that stands in nice contrast to McCartney’s rock and roll lead on the Abbey Road cut. Here’s the rock and roll highpoint of the night as Young and Crazy Horse tear through one of the earliest Lennon/McCartney classics. The rowdy performance really rouses the audience, which is generally pretty sedate throughout. Young even opens with the “beauty queen” rhyme for “seventeen” that opened McCartney’s original draft. The Brazilian keyboard great had a top five Billboard hit with this one back in 1968, but here it feels a little out of place. Plus the theme has been well-established by this point: they’re mostly paying tribute to the work McCartney produced with the Beatles. Aside from Alison Krauss (and McCartney himself), no one is bothering with anything from the 40+ years that followed the Beatles’ breakup. It’s not that this isn’t a decent reading of the song, it’s that the song choice is particularly uninspired. “We Can Work it Out” is such a classic Lennon/McCartney collaboration that it really isn’t suited for a McCartney-only tribute. With so many songs to choose from, it’s too bad Chris Martin and company didn’t dig a little deeper. A totally competent cover of the most-covered song in pop music history. Again, there’s nothing wrong with Taylor’s performance (accompanied by Krall on piano), it’s just such an easy choice. Now this is more like it. As Beatles-era McCartney classics go, this one is considerably less heralded than songs like “Yesterday” and “And I Love Her.” Krall sounds great as she sings and plays piano (with Taylor accompanying her on acoustic guitar). Ah, here we go – nothing like the man himself to remind us that he’s been an active songwriter during all the years since his first band broke up. For “My Valentine” he’s backed by Krall on piano and Joe Walsh on acoustic guitar (playing fills original handled by Eric Clapton on McCartney’s then-current Kisses on the Bottom). Then it’s back to McCartney’s touring band. Breaking out the piano-driven rocker from Band on the Run was a terrific choice. Joe Walsh is back on stage, along with Dave Grohl, for the guitar dual on “The End.” McCartney has performed the final trio from the Abbey Road medley in concert countless times, but it never seems to get old. Having Walsh and Grohl trading licks with McCartney, Rusty Anderson, and Brian Ray makes it even better. Shout! Factory’s Blu-ray offers a choice between bass-heavy (perhaps a tad too bass-heavy, if we’re being honest) DTS-HD MA 5.1 and a better-balanced LPCM 2.0 stereo track. Sadly there are no extra features, leaving this hour-long presentation a bit slim in terms of content. 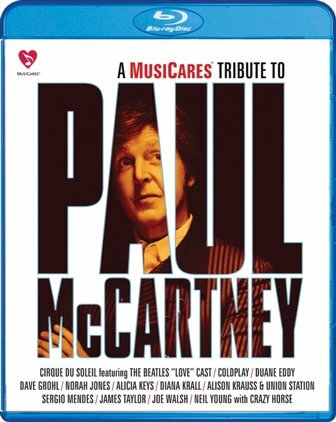 But again, for the legion of Macca buff out there, A MusiCares Tribute to Paul McCartney will need to be added to their collection posthaste.